An easy one-pot recipe for the classic Southern dish! 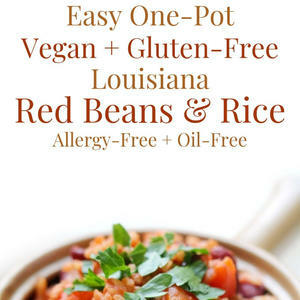 This Vegan & Gluten-Free version of Louisiana Red Beans & Rice is full of deep smoky and spicy flavors, rice, kidney beans, and veggies. It's allergy-free, oil-free, and still a hearty and comforting meal without the meat!